Did you know you can get latest from NephJC in Apple News? Follow this link and enjoy. Introducing NephJC Asia, a third chat, timed for India. The NSMC and NephJC Code of Conduct. The is the shirt that you have been waiting for. And if it is not the shirt of the dreams, it is the shirt that will keep the light’s on at NephJC HQ. Joshua Waitzman tells you how to use NephJC to get ahead in fellowship and in life. Kidney Week and the NephJC Beach Party were a blast! 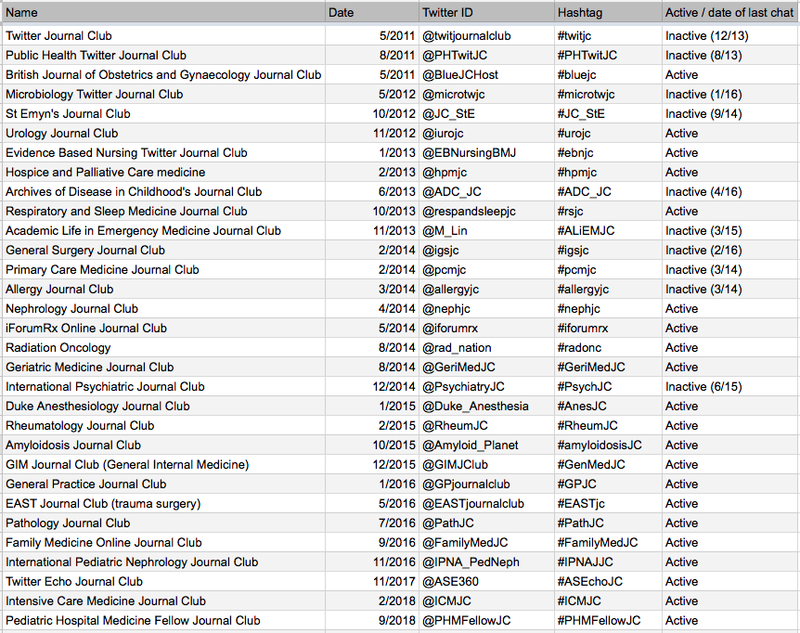 Appendix 2 of the NephJC Primer on Twitter Journal Clubs contained a list of all known twitter journal clubs. This information used to be stored on the Wikipedia page on journal clubs, you can see it in the history. But Wikipedia, home of a comprehensive list of English Canadian game shows (we are not kidding, see French list here), did not think a list of Twitter journal clubs was encyclopedia worthy. So we are recreating the list here as a Google Sheet. Have at it. In the tradition of Andrew Ibrahim’s Visual Abstract Primer, NephJC is proud to announce the NephJC Twitter Journal Club Primer. We have been working on this for about 4 months and think it’s pretty good. The Primer is intended to be a living document and the latest version will always be hosted here. Feel free to tweet feedback.